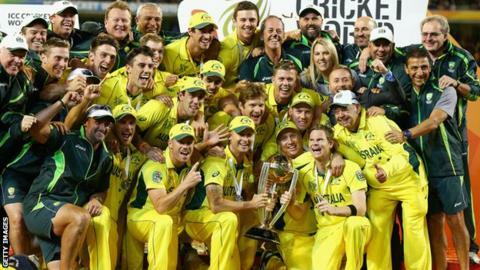 Australia's win was the second in as many tournaments by a host nation after India's triumph four years ago. "It was a brilliant performance. Australia were the best team in the tournament, fantastically led by Michael Clarke. Today they were just too powerful and strong for New Zealand, who have been great throughout the tournament. They've had everything you'd need in a one-day side, with the left-arm pace of Johnson and Starc. They've got everything covered." Their path to Melbourne came with eight successive wins, all on home soil, and most of the pre-match speculation was of how McCullum's men would deal with the change in conditions. "Australia's depth of fast bowling has an Englishman quaking in his boots when thinking about what might happen in the Ashes." The talismanic McCullum, so often a slayer of new-ball attacks throughout the tournament, aimed two wild swings at Starc, missed with both, then was bowled by a brilliant yorker. Far from the batting paradise predicted, the pitch was slightly two-paced and offered both turn and some uneven bounce. But that is to take nothing away from the Australia pace attack, Starc in particular, who bowled with hostility and found movement both in the air and off the seam. New Zealand clung on without progressing, but when Glenn Maxwell's off-spin got through a lazy Martin Guptill stroke and Kane Williamson patted back to Johnson, they seemed in disarray. However, from 39-3, they painstakingly rebuilt through semi-final hero Elliott and Ross Taylor. Elliott, who successfully overturned a Maxwell lbw decision on 15, scored almost exclusively through the off-side to become only the fifth man to register a half-century in the semi-final and final of the same World Cup. Taylor made 40 in a stand of 111 provided a platform for the batting powerplay. Yet it was the powerplay that began New Zealand's slide, as Faulkner returned to have Taylor athletically caught behind by Brad Haddin and bowl Corey Anderson two balls later. When Luke Ronchi played an awful waft to be caught at slip off Starc, three wickets had been lost for one run in eight balls. There was no support for Elliott, who was caught behind attempting to heave Faulkner and, when Maxwell superbly ran out non-striker Tim Southee with a direct hit for the final wicket, it was the perfect demonstration of Australia's dominance. In all, New Zealand lost seven wickets for 33 runs. Though Aaron Finch inside-edged on to his pad to be caught and bowled by Trent Boult, David Warner's brisk 45 gave Australia's chase early momentum. After he was caught hooking Henry, there began a period of pressure that Clarke and Smith battled to absorb, the latter needing the fortune of seeing the bails stay unmoved as a Henry delivery trickled on to the base of the stumps. It would be New Zealand's last chance, as Clarke's cuts and drives down the ground accelerated Australia towards victory. He could not see the job through, but Smith became the first man to score five successive World Cup half-centuries then pulled Henry for the winning runs.